Facebook is the biggest social networking platform in the current context of world. Facebook has been used as the platform for different purpose from making friends to business. So there can be some fun with this website too, like making a Fake Facebook Status. Like making a chat between different peoples. I do have an example to show you, hope you like you. I have made a simple Google, Yahoo, Bing and facebook chatting status. You may try some tricks on Facebook for this, but why to use a trick if we get it just by some clicks. 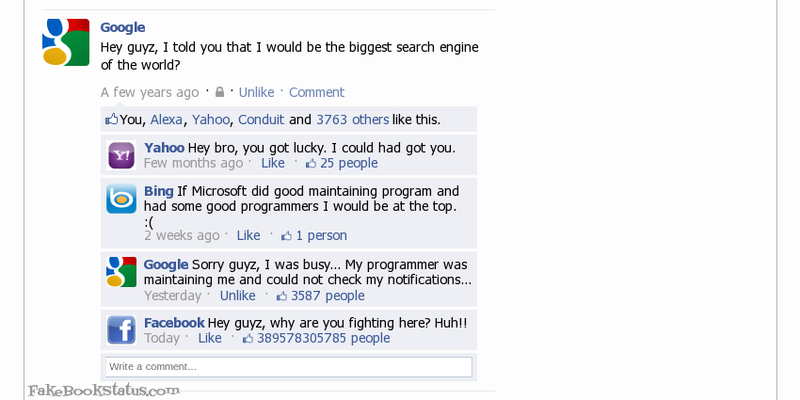 Try out the Fake Facebook Status Creator now.